There has been a lot of news coverage and proposed legislation lately calling for the banning of antibiotic use in farm animals. People can get very frightened when we talk about antibiotic resistant bacteria or antibiotics in the meat supply. This has been an especially personal topic for me because our family recently had a scare with antibiotic-resistant bacteria. In May, my daughter had a little lump behind her ear. I found it over a weekend and by Sunday evening, she was running a low fever, so we went to the doctor on Monday morning. By 6pm, we were admitted to the hospital with a very high fever and a freshly-lanced abscess. It took 2 of days of testing, and she was diagnosed with MRSA (methicillin-resistant staphylococcus aureus). She spent three nights in the hospital on IV antibiotics. Now, she’s fine and back to her little rotten self. Experiences like ours are very scary, and I know there are a lot of parents with much worse stories to tell than mine. However, most people know very little about antibiotic-resistant bacteria like MRSA. When they hear about antibiotics in relation to our food supply, they don’t know what to think. First, what exactly are we talking about? Antibiotics administered to animals headed to the food supply. Why are animals given antibiotics? There are two main reasons why animals are given antibiotics. The most obvious reason is that animals are given antibiotics when they are sick or injured to fight infection. Most people agree that it would be inhumane to withhold a drug from a sick animal and allow it to suffer. Even organic farms and antibiotic-free farms have a protocol in place to treat a sick animal and remove it from their herd. Sometimes animals are given antibiotics to prevent them from getting sick. Just like kids, young animals are prone to infection. In some farms, animals live very close to one another and they are not very clean creatures (you just can’t teach a piglet to wash his hooves), so if one gets sick, they could all get sick very quickly. That could spell disaster for a farmer, so some farms choose to feed a low level of antibiotics to prevent disease. Some antibiotics are given to improve how fast and efficiently animals grow. There are new rules about antibiotics from FDA as of June 2015. I’m doing some research on them to make sure I understand them before I share what they mean in this post. Thanks for bearing with me. You may have heard a statistic in a news story that said that 80% of the antibiotics sold in the US are given to livestock animals. That number is largely disputed. First, it is impossible to know how many antibiotics are sold in the US, for use in livestock or in humans. Second, a large percentage of drugs used by farmers are not useful in human medicine. Lastly, livestock represent a larger population of bodies than do humans. And, cows and pigs are a lot bigger than humans; pound for pound, they need more antibiotics. What is the real number? Who knows? What about antibiotics in my meat? When people in the food industry talk about antibiotics, there are two terms they use: antibiotic residues and antibiotic resistant bacteria. ‘Antibiotic residues’ refers to actual antibiotic chemicals that have been given to the animals, either fed or given as injections, remaining in the edible tissue (meat, fat, or even milk). The Food and Drug Administration regulates the approval and use of antibiotics in animal medicine. Any antibiotic that is given to a food animal has a specified ‘withdrawal time’ which is the amount of time that the antibiotic has to be withdrawn from the animal before it is slaughtered. These times are based on how long it takes the animal to process the antibiotic so that it is eliminated from the body. Farmers must wait to slaughter an animal for that amount of time after giving the antibiotic to the animal or they will be breaking the law. The Food Safety Inspection Service (part of USDA) monitors the meat supply and tests for antibiotic residues in the meat. The levels of antibiotic residues found in the meat supply are very low (below 1%), and tests are done on a worst-case scenario basis, which means FSIS tests the tissues that are most likely to contain antibiotic residues (liver and kidneys) and they test a larger percentage of suspect animals (old cows, animals with injection scars, etc.). Although the levels are not zero, I am not really worried about antibiotic residues in meat. A group called the US Farmers Ranchers Alliance has a video of experts discussing antibiotic residues. ‘Antibiotic-resistant bacteria’ refers to bacteria that are not easily killed by common antibiotics, they are resistant. Bacteria are everywhere, and there are millions of species, strains, and serotypes… all fancy ways of saying ‘different’ bacteria. Bacteria have a genetic code, just like humans, and they change and evolve with each generation. Unlike humans, they multiply at crazy-fast rates, so their genes can change at fast rates. When you introduce something to kill the bacteria like antibiotics, most of them die, but a few live. The ones that live may have had something in their genetic code that allowed them to survive the antibiotic treatment. All the other bacteria are gone, so that leaves more room and food for the left over bacteria to grow. When they grow, they pass their antibiotic-resistant genes to the next generations. Eventually, those antibiotic-resistant bacteria are spread around, and found all over the place. We have to learn to fight them in different ways. A study from 2003-2004 found that MRSA (the bacteria my daughter fought) was in 1.5% of American noses. That was 8 years ago, and the bacteria have been spreading since then, so the numbers are probably larger now. Are antibiotic-resistant bacteria in my food and how did they get there? Yep. Antibiotic –resistant bacteria are in our food supply. They are everywhere. Our food is handled by several different people and goes through several steps to get to our plates, and bacteria can be introduced at any of those steps. Some people want to blame the use of antibiotics in animal feed and that may be part of it, but it is likely that several actions contribute to the spread of antibiotic-resistant bacteria. Can it make me and my family sick? There are some forms of dangerous food borne pathogens like Salmonella and E.coli that have developed some resistance to antibiotics. That means that if you get one of these bacterial infections in your gut, it will be harder for doctors to help you fight them. But, even the non-resistant forms of these bacteria are very dangerous and can make you very, very sick. Antibiotic resistant bacteria are susceptible to foodsafety measures such as cooking food thoroughly and keeping raw food away from cooked food. Cooking kills antibiotic-resistant bacteria just like it kills antibiotic-susceptible bacteria. Use a meat thermometer to be sure you cookmeat thoroughly. Hot soap and water wash antibiotic-resistant bacteria off of counter tops and utensils. Antibiotic-resistant bacteria cannot grow as well in cold environments just like the antibiotic susceptible strains, so getting fresh food and leftovers chilled quickly is very important. Antibiotic-resistant bacteria can’t jump through the air from raw food to cooked food, so keep raw and ready-to-eat foods separate. 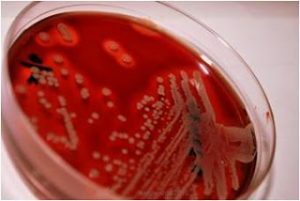 The main two bacteria species that we hear about when we talk about antibiotic resistance are Staphylococcus aureus (MRSA) and Clostridium difficile. Although they are huge issues in the medical industry, the CDC does not see them as a risk in the meat industry. Food safety practices should keep you from getting sick from these bacteria in your food. However, you may have heard that MRSA has been found in 6.6% of pork samples in a US study. I emailed the author of that study for this post. She was really nice and said that the worry with MRSA in meat is not as much about getting sick from it being in your food as it is about the MRSA spreading from the raw meat to other surfaces and being introduced to a scratch or an open sore and causing severe skin infections, like the one my daughter had. Lots of bacteria from raw meat can cause skin infections if they are introduced to an opening in the skin, and these antibiotic-resistant ones are very hard to fight. So, my advice is to be extra careful with raw meat, especially with children (face it, they are dirty little monsters. I’ve seen mine lick the bottom of her shoe.). Keep raw meat separate from other food from the time to pick it out at the grocery store until you cook it. Use a plastic bag to keep raw meat away from other food items and away from surfaces like the bottom of the grocery cart. 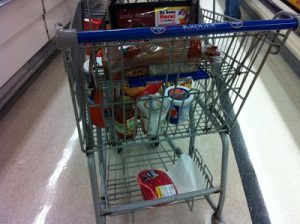 My friend Karen sent me this picture of her grocery cart. Her roast is in its package away from the rest of her food. Looks like she put a piece of butcher paper under it. Way to go Karen! There have been studies connecting antibiotic-resistant E. coli bacteria from chicken to urinary tract infections. If I have been handling raw meat, I wash my hands before AND after going to the restroom. I called and asked the pediatrician if there was any way to know where the MRSA that infected my daughter came from, and there was not. The doctor told us that lots of people are infected with it and kids ‘pick their nose, then pick their wounds.’ Gross. What about buying meat from animals that have not been given antibiotics? There are companies and farms that offer meat from animals that have never been given antibiotics. I’ve talked about such programs in a previous blog post. If you choose to buy those products because you want to support the practice of never giving animals antibiotics, that’s fine, but you should know that meat from these farms are not guaranteed to be free from antibiotic-resistant bacteria. The meat is not any safer than the meat that does not make that claim. A recent study found that the levels of Staphylococcus aureus and MRSA in pork were the same regardless of it being from pig farms that did not use antibiotics. Denmark has banned the use of sub-therapeutic antibiotics and the results have not been positive for their pork industry. Jeff Fowle, a rancher and blogger from California discusses the ramifications of Denmark’s decision in his blog. Like I said earlier, there is lots of info on the internet about antibiotics (residues and resistant bacteria) in meat and in general. I don’t know all the answers. Here is a list of a few more resources if you are interested.